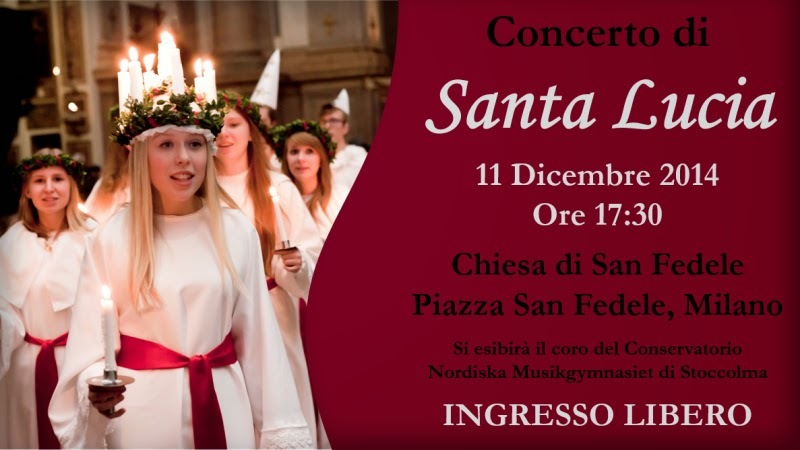 "Saaaaaantaaaaa Luuuciiiiiiaaaaaaa" in your head?--whose eyes were gouged out, lights are lit to bring hope in the December darkness. 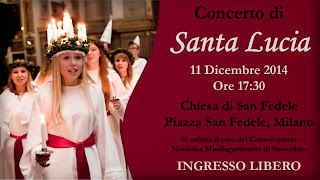 Her saint day in the Catholic calendar really is the 13th of December, but the Swedish choir is busy between appointments in Rome and Milan, so they'll be giving us a free concert--thanks to the Swedish-Italian Chamber of Commerce--on the 11th of December at 5:30 P.M. in the church of San Fedele on the other side of the Galleria Vittorio Emanuele from the Duomo. P.S., obviously, I've broken my usual practice of putting only my own photos on the blog...here's the Chamber of Commerce's illustration with info. P.P.S., thanks to my friend, Jill, who reminded me of this by now annual happening...mark your calendars already for 2015!